But back then social data wasn’t ready to help market researchers. In 2009 barely one-third of Americans used social networks, and vendors’ focus on counting keywords ignored the silent majority of social media users. Nineteen Insights estimates that when market researchers first encountered social data it provided intelligence on just 16% of Americans. 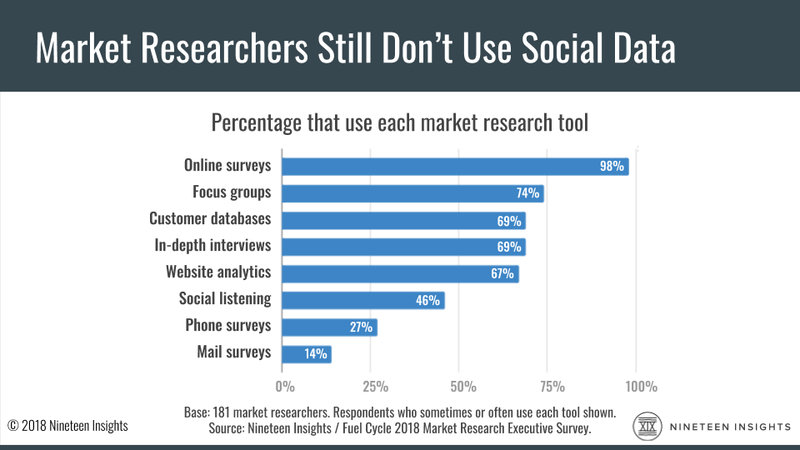 Because of their poor initial experiences, today less than half of market researchers use social data. But social data has overcome its early problems and is ready for a renaissance. Social listening now captures data on seven in 10 Americans. Leading research firms once again see the value: In 2018 Ipsos and Meltwater acquired listening platforms. And savvy research teams now use social listening to discover buyer needs, develop new products, identify problem products, create better marketing, and even predict sales. To learn more about how other companies use social market research and how you can do the same download Nineteen Insight’s free research report The Social Market Research Renaissance.